The purpose of this project is to use the archives of the University: documents, photographs, physical objects, and audiovisual materials – to tell the story of athletics at the University of Oregon. More than just statistics of accomplishments, this is the story of people and events that changed athletics at the University of Oregon over the past 110 years. It is also the story of athletics in higher education: the relationship and the issues involved between athletics and education over time. 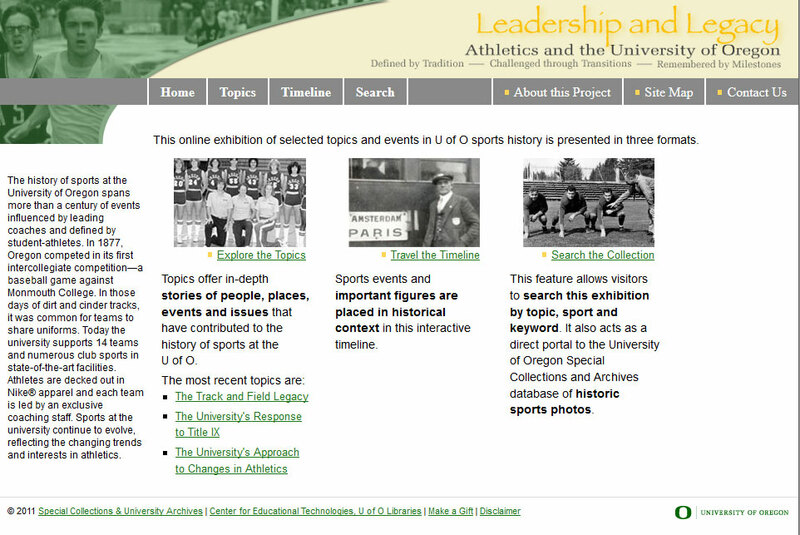 The project includes a collection of topics, a gallery of documents and images, and a timeline of events in the history of sports at the University of Oregon. All three areas can be expanded over time as resources permit. The written and digitized material serves as a portal to more information and further research available at the University of Oregon and on the Web. A goal of this project is to support university curriculum—athletics, history, sociology, et cetera—as well as provide reference information to alumni and promote the University of Oregon. We also support University of Oregon alumni, friends, and fans that want to remember their favorite sports teams and athletes or who want to learn more about the history of sports at the University of Oregon. The website and digital collection were both made possible through a generous gift from Terry and Dave Taylor ’78. This project was conceived, researched, and constructed with the help of many departments within the University of Oregon Libraries: Special Collections and University Archives, Metadata and Digital Library Services, the Image Services Center, and the Center for Educational Technologies: Interactive Media, which designed and constructed the original online exhibit. The original research and writing for the website was done by Julie Malmberg, ’06 MBA, and exhibit review completed by Kim Harper-Kennedy. The site was redesigned and content updated by the Digital Scholarship Center in 2013.